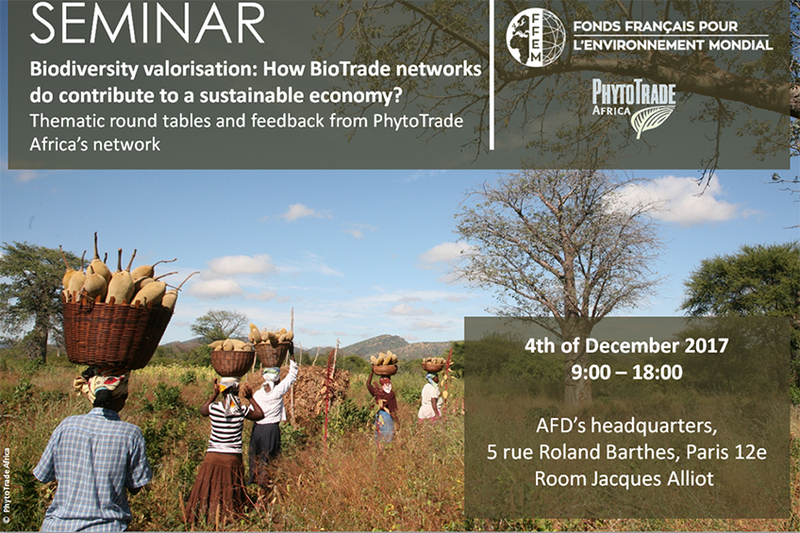 How do BioTrade networks contribute to a sustainable economy? This was a question that was explored and some answers presented at a PhytoTrade Africa event that Parceval attended in Paris in December 2017. This event gathered organisations and businesses from Southern Africa and from Europe, and information and experience on BioTrading (BioTrade refers to the commercial collection, processing and sale of natural products derived from the native biodiversity), the Nagoya Protocol and Access and Benefit Sharing (ABS) were presented and discussed. Ulrich Feiter, Parceval’s CEO, who attended the event, shares what took place and what it meant for Parceval. First of all, could you tell us more about PhytoTrade Africa and Parceval’s connection to the organisation? PhytoTrade is a trade association working in Southern Africa which helps its members to bring their natural products to international and European markets. One notable example is the Baobab; there were many regulatory hoops to jump through and it also required quite some financial commitment – PhytoTrade assisted with and facilitated the process of the Novel Food registration for Baobab in Europe. PhytoTrade also works with local community-based organisations or NGO’s to support initiatives that empower communities and are strongly focused on sustainable and ethical supply chains. Parceval became a member of PhytoTrade in 2015.
Who attended the event in Paris? There were several PhytoTrade members and mostly French companies, but also companies from the Netherlands, Germany and Italy, who trade in natural products. The event was about connecting companies from the South that are market ready with companies from the North to create new business opportunities, as well as to share information and experiences on the challenges, issues and opportunities in BioTrade. What did you do at the event? The first day looked at the institutional and legal frameworks around BioTrade and there were several roundtables that explored BioTrade in relation to biodiversity conservation, sustainable use and Access and Benefit Sharing (ABS). Parceval was part of hosting the roundtable on sustainable use which looked at how resource management and traceability could be maintained in both wild harvesting and cultivation and in the export of small quantities as well as bulk exports. The second day was a business dialogue and all attendees had an opportunity to present their work. The topic of ABS was also explored further, and some companies, including Parceval, presented their experiences and the challenges encountered in this arena, as well as the challenges that had been resolved. What did you gain from the event? It was a good networking opportunity with valuable trade leads that we look forward to exploring. I also had the opportunity to visit the Picasso museum while in Paris which was fantastic!